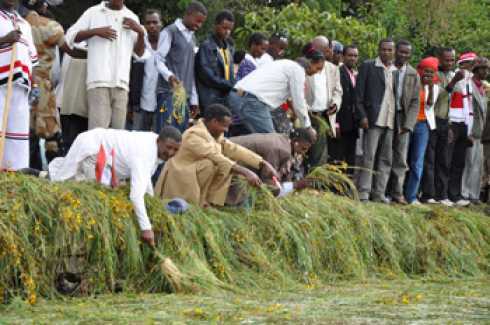 The Oromia State Culture and Tourism Bureau said the annual Thanksgiving Day of the Oromo people, Erecha, would be celebrated with various festivities on October 4, 2015. Getu said that the vent would be attended by senior federal and state officials, tourists, UNESCO representatives and millions of people. He also said the government has been working to develop the culture, history and art of the Oromo people to pass down to posterity exercising rights guaranteed by the FDRE Constitution. The Head said the Oromia State has built a cultural centre in Addis Ababa which would serve as an institution to conduct research on the culture and history of the people and preserve historical places including Anole, Chelenko and Madda Walabu. According to him, various developmental activities focusing on culture and history have been carried out in the GTP I as the Oromo people culture should develop with the country’s economic growth. These efforts would be sustained in GTP II building various cultural centers in the state, he added. Getu further noted the Erecha ritual event has been celebrated by the people for many years as it is one of showcases in the Oromo Gadaa system though they faced challenges under previous governments. The event would assist in the effort towards making the country a middle income economy by 2025 and fighting poverty. He said that the Bureau has been doing its level best with pertinent stakeholders for the registration of the event as a World Heritage. The Gadaa system was registered temporarily a year ago by UNESCO and would be registered permanently within a year, he added. The event would be marked starting from the eve with Abba Gadas Forum, panel discussions, musical concerts and related programs. Meanwhile, State Security Administration Bureau said it has been making preparations in collaboration with stakeholders to make Erecha and other religious and cultural celebrations peaceful. Bureau Deputy Head and Religious Affairs Process Head Mesfin Assefa called upon the people to be cooperative and contribute their share as usual to making the events peaceful and stable strengthening shared values and fighting extremist activities. He said that the people are expected to inform the bureau and other security organs if they come across any strange act.